At one time, Gracie Mansion and Carl Schurz Park were stops on my whirlwind tours of NYC for friends, visitors and family. I always strove to include places that were both interesting, scenic and off the beaten path. Carl Schurz Park and Gracie Mansion are probably some of the least visited landmarks in the city - many NYC residents have never been there. One reason is the location - easternmost on the Upper East Side and quite far from the nearest subway (the Lexington avenue line is one km away). It is certainly a planned destination - there is little of note in the nearby in the Yorkville neighborhood. The elegant Federal-style wood frame dwelling was built in 1799 by a prosperous New York merchant named Archibald Gracie. The country house, overlooking a bend in the East River, was five miles north of the City at the time. A number of historical twists and turns later, the city acquired the property (1896) and in 1942 it became the official residence of the mayor of New York City. Parks Commissioner Robert Moses convinced City authorities to designate it as the official residence of the Mayor, and in 1942, Fiorello H. La Guardia moved in. Read a short history here. 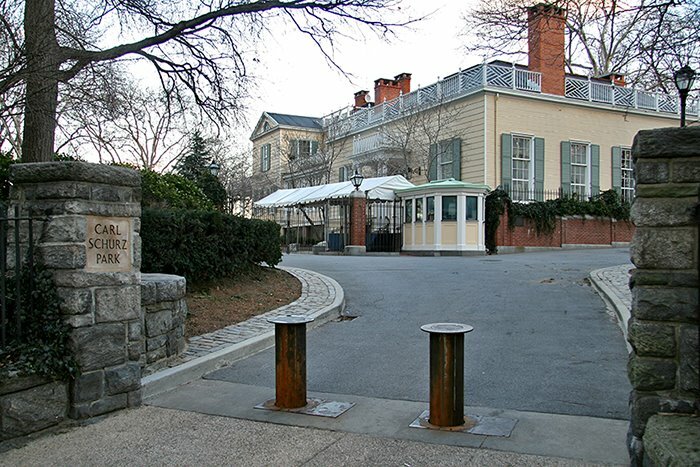 Mayor Bloomberg has chosen not to live at Gracie Mansion, preferring his residence at 17 E. 79th Street - see my article on his residence here. The mansion is now used for meetings and events. In 2002, the interior and exterior was restored with increased accessibility to the public and City agencies. Geography Note: If you examine a map of Manhattan, you will notice that between 23rd and 53rd Streets, First Avenue is the easternmost north-south thoroughfare. As the island becomes wider heading north, you have the addition of Sutton Place/York Ave. Then at 79th Street extending to 90th, going further east yet, East End Avenue. Carl Schurz and Gracie Mansion lie east of East End Avenue.